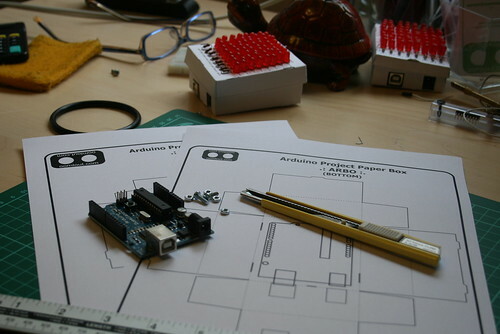 Around oomlout HQ we have loads of Arduino projects on the go. Most are a long ways off from being completed, but a few are close. However before official completion is reached enclosures must be found. We have searched the internet, scoured catalogs and walked every aisle at our local grocery store questing for the perfect box. Many good options were found however none of them were perfect. In dejection we looked around our office to realize we actually had everything we needed at our fingertips. 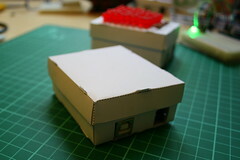 A template was drawn, printed onto cardstock, cut out, and folded to a box, at last the perfect enclosure. If you've had a similar problem you're just 4 short steps away from having it solved. 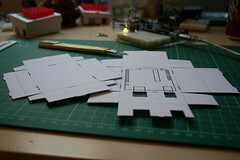 Cut along the solid lines and scour the dotted lines for folding (the back side of an exacto knife works well for this). Next fold up the sides and tuck in the locking tabs. 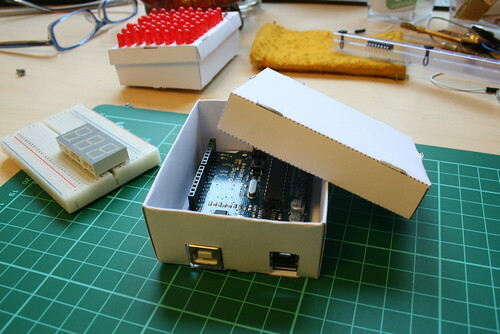 A plain paper box with an Arduino inside can be rather underwhelming, but with such an easy to construct housing the possibilities are endless. 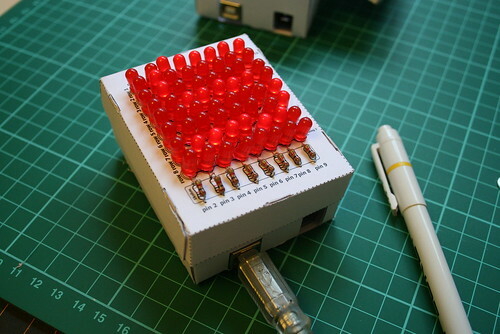 Here's a photo of a soon to be released diy LED matrix project.